Global Fitness Business Coaching Company, NPE, signs exclusive three-year partnership with Fitness Australia, the peak health and fitness Association with over 25,000 Registered Personal Trainers, Fitness Instructors, Fitness Businesses and Suppliers Australia-wide. 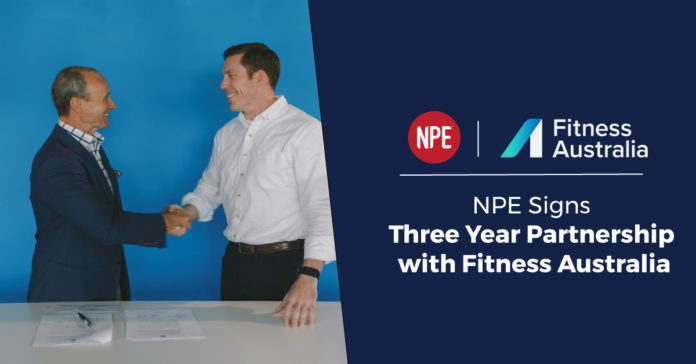 NPE CEO Sean Greeley has been helping fitness businesses for over 11 years and recognizes the overwhelming list of challenges fitness businesses face in an increasing competitive market. Greeley acknowledges running a business in Australia isn’t as simple as registering for GST or remembering to pay taxes on time. “NPE is a long-time supporter of Fitness Australia. Now we’re taking our relationship to the next level by giving Fitness Australia members access to NPE’s expertise and tools. These will take the form of eBooks, business workshops, and online advice. “We’re super excited about this partnership because NPE brings a wealth of fitness industry specialists from around the world – people who have walked in the shoes of a fitness business owner, manager and trainer.” – Bill Moore, CEO of Fitness Australia. NPE will also be presenting at Filex this year (Saturday and Sunday, 21-22 April), inviting Fitness Australia members to attend workshops and information sessions. For more information on how to register, contact NPE office at (02) 8074 3506.